Welcome Mastergblogians, Computer Hardware is the collection of physical elements that constitutes a computer system, Computer Hardware refers to the physical parts or components of a computer all of which are physical objects that can be touched. POWER SUPPLY: A power supply unit (PSU) converts alternating current (AC) electric power to low-voltage DC power for the internal components of the computer. Laptops are capable of running from a built-in battery, normally for a period of hours. MOTHERBOARD: The Motherboard is the main component inside the case. It is a large rectangular board with integrated circuitry that connects the other parts of the computer including the CPU, the RAM, the Disk Drives (CD, DVD, Hard Disk, or any others) as well as any peripherals connected via the ports or the expansion slots. The CPU (Central Processing Unit) performs most of the calculations which enable a computer to function, and is sometimes referred to as the “BRAIN” of the computer. It is usually cooled by a heat sink and fan. Most CPUs include an on-die Graphics Processing Unit (GPU). The CHIPSET which includes the north bridge, mediates communication between the CPU and the other components of the system, including main memory. The READ ONLY MEMORY (ROM) stores the BIOS that runs when the computer is powered on or otherwise begins execution, a process known as Bootstrapping, or Booting or Booting Up. The BIOS (BASIC INPUT OUTPUT SYSTEM) includes boot firmware and power management firmware. Newer motherboards use Unified Extensible Firmware Interface (UEFI) instead of BIOS. BUSES connect the CPU to various internal components and to expansion cards for graphics and sounds. EXPANSION CARDS: The Expansion Card in computing is a printed circuit board that can be inserted into an expansion slot of a computer motherboard or backplane to add functionality to a computer system via the expansion bus. 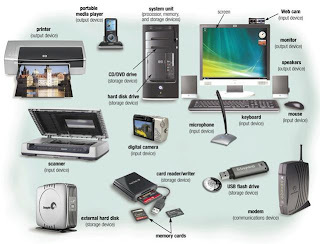 STORAGE DEVICES: Computer data storage often called storage or memory refers to computer components and recording media that retain digital data. Data Storage is a core function and fundamental component of computers. FIXED MEDIA: Data is stored by a computer using a variety of media. Hard Disk Drives are found in virtually all older computers due to their high capacity and low cost, but solid-state drives are faster and more power efficient, although currently more expensive than hard drives, so are often found in more expensive computers. Some systems may use a disk array controller for greater performance or reliability. REMOVABLE MEDIA: To transfer data between computers, a USB flash drive or Optical Disc may be used. Their usefulness depends on being readable by other systems; the majority of machines have an Optical Disk Drive, and virtually all have a USB port. You're definitely correct, I'd love to find out more on this subject! I'm as well interested by best mesothelioma lawyer since I believe it is quite unique these days. Keep this up! I like what you people are up to. This type of clever effort and coverage! Continue the very good work guys, I have included you on our free films to watch blog. Hi can you inform me which blog platform you're using? I am seeking to get started with our blog on tooth implant soon but I'm having a hard time making a choice. I just arrived over here via a different web page on the subject of latest movies online and imagined I may as well read this. I enjoy the things I see thus I am just following you. Looking forward to finding out about your website yet again. Pretty nice post. I simply stumbled upon your blog and wanted to mention that I've truly enjoyed browsing your weblog posts. After all I will be subscribing for your rss feed and I am hoping you write again soon! I was speaking to a friend of mine about this and also about free movie websites too. I believe you made some very good points here, we're also excited to keep reading material from you.